Polk Street (also sometimes referred to by its German name, Polkstrasse) is a street in San Francisco, California, that travels northward from Market Street to Beach Street and is one of the main thoroughfares of the Polk Gulch neighborhood traversing through the Tenderloin, Nob Hill, and Russian Hill neighborhoods. The street takes its name from former U.S. President James K. Polk. The street also has bike lanes, which were approved in 2002. San Francisco bike route 25 runs along Polk Street, and is the only North-South route suitable for casual bicycle travel within at least a mile in either direction. There is an ongoing debate on whether to increase the level of these improvements. Polk Street is named for James Knox Polk (November 2, 1795 – June 15, 1849) the 11th President of the United States (1845–1849). During the Mexican–American War, and after the Texas annexation, Polk turned his attention to California, hoping to acquire the territory from Mexico before any European nation. The main interest was San Francisco Bay as an access point for trade with Asia. The street is sometimes still referred to by its German name Polkstrasse or Polk Strasse ("Straße" being the German word for "street"), dating back to the time when it was the main commercial street for San Francisco's German immigrants. In 1912, the German community built California Hall on the corner of Polk and Turk Street, a building resembling a German-style town hall (rathaus). A crowd walks up Polk Street during the March to Remember and Reclaim Queer Space, March 2018. Polk Gulch is the neighborhood around a section of Polk Street, and its immediate vicinity, that runs through the Nob Hill and Russian Hill neighborhoods from approximately Geary Street to Union Street. The name, somewhat humorous, arises because the street runs over an old stream at the bottom of a gently-sloped valley. Polk Gulch was San Francisco's main gay neighborhood from the 1950s until the early 1980s, although around 1970 many gays began to move to The Castro (formerly Eureka Valley) and SOMA because many large Victorian houses were available for low rent or could be purchased with low down payments. Several gay, lesbian, and transgender bars and clubs remain[when?] in the area. 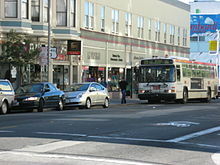 As the original center of the city's LGBT community, it has remained one of the core centers along with The Castro and the South of Market (SOMA). On New Year's Day 1965, police raided a gay fundraising party for the newly founded Council on Religion and the Homosexual in California Hall on Polk Street, an incident that, according to some, marked the beginning of a more formally organized gay rights movement in San Francisco. In 1972, Polk Street was the location of the first official San Francisco Gay Pride Parade. In the 1950s through the 1970s Halloween on Polk Street became a major attraction for tourists and locals. In the 1990s and 2000s the neighborhood started to gentrify. It remains prominent for its nightlife. The San Francisco Police Department Northern Station serves Polk Gulch. The street remains a busy business district with many restaurants, cafes, and numerous bars. Today, the Academy of Art University owns a building on the street for academic purposes. Frank Norris's 1899 novel McTeague is about a dentist whose office is on Polk Street. In 2008, McTeague Saloon, located at 1237, opened in his honor. ^ a b "The resurrection of Polk Street – East Bay Times". Retrieved 2017-06-04. ^ Rachel Gordon (May 18, 1999). "Supes approve bicycle lanes on Polk Street". San Francisco Chronicle. Retrieved 23 November 2010. ^ "San Francisco Bike Map" (PDF). 2013. ^ a b c "San Francisco Landmark #174: California Hall". noehill.com. Retrieved 2017-06-04. ^ a b c d Smith, Kristin (November 4, 2011). "Tears for Queers". The Bold Italic. Retrieved 2017-06-04. ^ Leslie Fulbright (October 12, 2005). "Polk Gulch cleanup angers some: Gentrification pushing out 'hookers, hustlers'". San Francisco Chronicle. Retrieved 10 November 2010. ^ "Polk Street - San Francisco Shopping". PolkStreet.com. 2010. Retrieved 23 November 2010. ^ "Polk Street". San Francisco City Guide. SF Merchants. 2010. Retrieved 23 November 2010.